The Delegation of the European Union to the Kyrgyz Republic jointly with Embassies of the EU Member States held a first ever EU Village in Kyrgyzstan on 26 May 2018. The event took place in Kyrgyz capital, city of Bishkek, with participation of 11 EU funded projects and 11 EU Member States: Austria, Belgium, Denmark, Finland, France, Germany, Latvia, Estonia, Spain, Sweden. The village was attended by approximately 2500 visitors who had a unique chance to learn about the culture, history and traditions of the EU Member States. They could visit national pavilions of participating EU Member States where they were offered traditional food and drinks, information materials, souvenirs and gifts. Also they could take part in quizzes about the history, geography and traditions of the EU Member States. In addition, the exhibition of 11 EU funded projects took place within the Village. Visitors could learn about the EU activities in Kyrgyzstan, ask questions and participate in interactive games. Besides, the exhibition of children’s drawings about the European Union took place alongside the Village. The event was accompanied by performances of local street artists, and theaters as well as performances of invited Austrian acrobats. The event was closed by a concert with participation of guest Estonian and Slovenian performers as well as famous local singers. 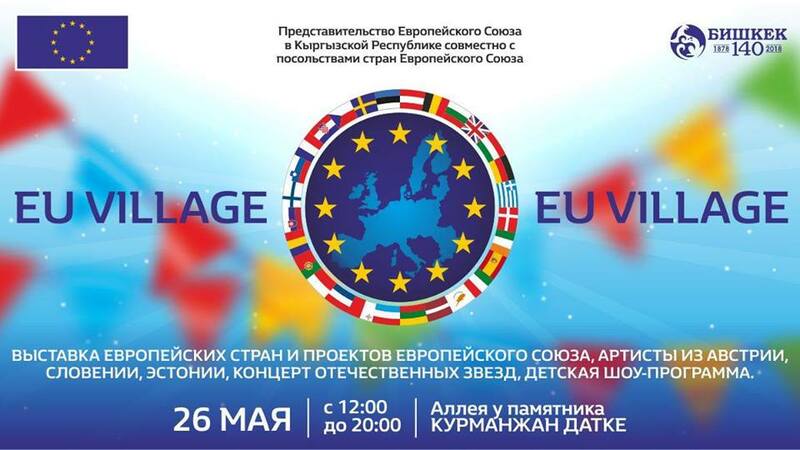 The Delegation of the European Union to the Kyrgyz Republic in cooperation with the European Embassies in the Kyrgyz Republic organize the EU Village day. The EU village aims to give Kyrgyzstani visitors a feeling of the atmosphere of Europe and its member countries. Many European countries and companies will present information and entertaiment in the center of Oak park, close to the monument with the status of Kurmanjan Datka. Come and see what Europe as to offer and take a virtual tour thru all the countries. See what they have to offer and enjoy the prepared entertainment. at the EU village event you can enjoy the European culture and cuisine. It also is a good time to meet the Embassies of EU Member States and partner countries. At 17:00 h there is a performance of the international choir.